Creativity: it feels intangible, yet it is made up of many tangible skills. We help agencies and design studios to be hot, charged up, and successful in providing new ideas and great work for their clients. We can look at existing training, costs and return on investment. ROI. How effective is the learning transfer giving effective delivery? Need more creative juices? Want to engage and retain staff? I create relevant programs to help businesses tap into their staff's own creativity and channel it into results. My drive is to engage and inspire staff and work closely to achieve that. Workshops can teach people a process, a new skill and then they light up as they see what they are capable of; that is empowering. I love seeing participants get fired up with new possibilities, gain confidence and explore ideas for client work. I put programs together to help creatives tap into that vein of gold, that unlimited creativity. Workshops are half day (3 hour), full day (6 hour), two days or a series of half day sessions. We can introduce the Design Workshops with a one hour talk and demonstration the week or the day before to intrigue and engage staff in learning. Workshops need to be booked a minimum of one week ahead so we can prepare workshop materials. 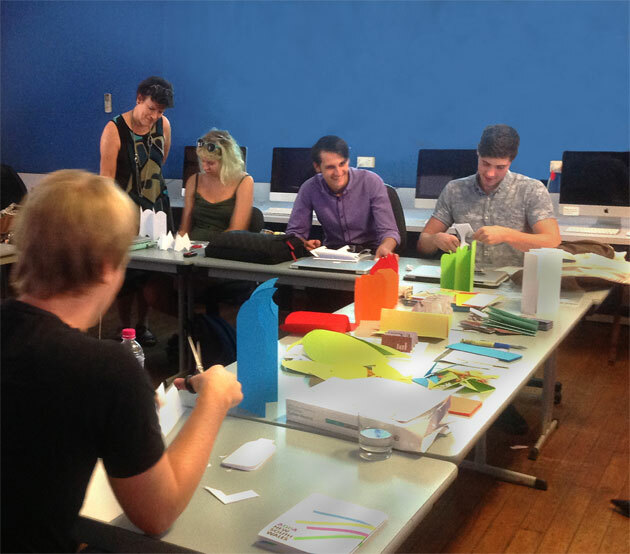 Design Workshops can be tailored for four to twenty four students depending on the topic. Small workshops will cover more course material in the time given. Most workshops are for 6-16 students so students have hands on time and contact with the tutor for questions and feedback. I have the students work cooperatively and collectively so they learn from each other and have the skills to do that day to day. Fees are adjusted to the number of students, length of the workshop and the tools and materials needed for the particular workshop chosen. Discounts are given when a series of three or more workshops are booked and paid for ahead. Workshops are usually run on site at your premises. A few venues are available around the CBD when you want to run Design Workshops externally to give a change of scene and break from interruptions. Once a workshop begins, no new students may join since it disrupts the teamwork, learning, and productivity. A cancellation fee applies for cancellation within 48 hours of a booked workshop date. Handouts are included so students can refer back to technical information and specifics given.